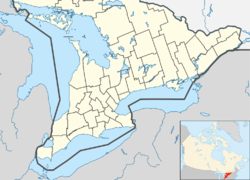 Alfred and Plantagenet is a township in eastern Ontario, Canada, in the United Counties of Prescott and Russell. Located approximately 70 km (43 mi) from downtown Ottawa at the confluence of the Ottawa River and the South Nation River. Near the town of Alfred, the Ontario Ministry of Natural Resources has designated the Alfred Bog as "a provincially significant wetland and an Area of Natural and Scientific Interest." Species of interest include the palm warbler, northern pitcher-plant, pink lady's-slipper, cottongrass, bog elfin and bog copper butterflies, and ebony boghaunter dragonfly. It also hosts one of the most southerly herds of moose. The bog is open to the public with a 272-metre (892 ft) boardwalk for nature walks. The township comprises the communities of Alfred, Alfred Station, Blue Corners, Centrefield, Coin Gratton, Curran, Glenburn, Jessups Falls, Lefaivre, Pendleton, Plantagenet, Plantagenet Station, Rockdale, Senecal, The Rollway, Treadwell, Wendover, and Westminster. The township administrative offices are located in Plantagenet. ^ a b "2011 Community Profiles". 2011 Canadian Census. Statistics Canada. July 5, 2013. Retrieved 2012-02-28. ^ "2006 Community Profiles". 2006 Canadian Census. Statistics Canada. March 30, 2011. Retrieved 2012-02-28. Wikimedia Commons has media related to Alfred and Plantagenet.